It took 110 minutes and a couple of penalty kicks to decide the AAC Championship game, but USF beat UCF 1-0 (5-3 PKs), coming away with the trophy and the automatic bid into the NCAA women’s soccer tournament. 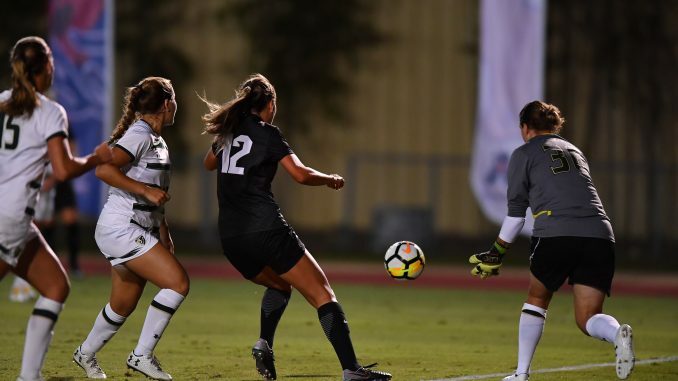 It was a defensive and goalkeeping duel on Sunday afternoon at the UCF Soccer Complex, receiving extra drama from an additional matchup in the War on I-4 rivalry series. The two teams tied each other back in late October, leading to a different result this afternoon. The Bulls (12-3-1) out-shot the Knights (13-1-2) 13-7 in regulation play, forcing junior goalkeeper and AAC goalie of the year Vera Varis to make nine saves. The Knights’ offense came to life in the golden goal periods, out-shooting USF 6-1, but a goal still eluded UCF. Bringing the game into penalty kicks, the Knights fell to the Bulls and senior goalkeeper Kat Elliot. Senior Kathellen Sousa, freshmen Stefanie Sanders and senior Christine Creighton all made their shots, but senior Morgan Ferrara failed to knock hers in on the Knights’ fourth attempt. Varis failed to save any of the five penalty kicks she faced, while Elliot blocked one. With the Bulls winning the AAC tournament, the Knights still have a very good chance of making the NCAA tournament due to UCF’s No. 8 ranking in the United Soccer Coaches poll. 30 fouls were committed, leading to four yellow cards. USF tallied three versus UCF’s one. The Bulls and Knights will find out its positions for the NCAA tournament in the selection show tomorrow. The final four will be played in Orlando at Orlando City Stadium.